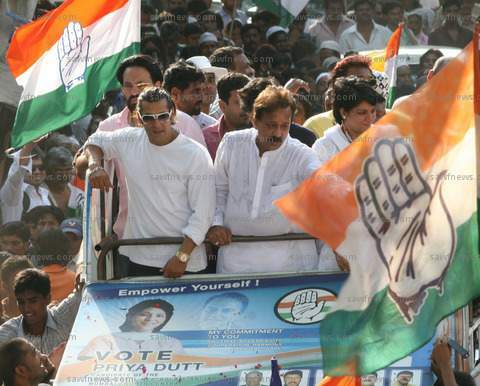 April 15, 2009, Salman Khan campaigned for Congress MP Priya Dutt in Mumbai’s North Central constituency, Bandra, on Wednesday, April 15, making up for the absence of her brother Sanjay Dutt. Sanjay Dutt, a member of Congress rival Samajwadi Party (SP), is likely to campaign for Abu Asim Azmi, a close associate of SP general secretary Amar Singh, pitted against his sister Priya Dutt. Riding an open van with Priya Dutt, Salman waved at cheering crowds gathered by the roadside. A youth was detained for pelting stones during Bollywood actor Salman Khan's rally in Mumbai on Tuesday. Salman is campaigning for Congress candidate Priya Dutt. There are reports of strained relation between Sanjay Dutt, Priya's brother and Salman Khan after the latter reportedly decided to campaign for Priya. Sanjay Dutt recently joined Samajwadi Party and was to contest from Lucknow seat. However, Supreme Court dealt a death blow to his political ambitions by barring him from contesting elections and refusing to stay his conviction in the 1993 serial bomb blasts case. He wore a white sweat shirt with rolled up sleeves showing off his golden watch and silver link bracelet. He wore white frame sunglasses with his signature earrings. His long brown locks were swept up and pushed back with a black wire hair band. Sanjay Dutt and salman Khan are both voters from the same constituency. Salman is known to be a people’s person with no political affiliation, but a lot of dear friend. In the current elections he has campaigned for BJP as well as the Congress, political rivals who have locked horns in a fierce electoral battle. Salman earlier conducted a road show for the Mumbai South Congress candidate Milind Deora and was mobbed by over excited fans. He also traveled to UP city to campaign for Congress candidate Annu Tandon. Later, Salman campaigned for Bollywood star and BJP nominee, Vinod Khanna, in Gurdaspur, Punjab.